Posted on August 12, 2008 by AFDStudios | Comments Off on Caption Contest 23 Winner! The winner of Caption Contest 23 is ... Danny Beaty! Balloon 1: With the might of the Lens of Opti-Max I will never be mocked again! Balloon 2: I’m still your hat and you are still talking to me. Balloon2: What’s this thing on my head? Balloon 1: Talk about your custom frames from Lenscrafters! Balloon 2: Talk about your custom head from Headcrafters! Balloon 2: I’ve lost my contact lens. Many thanks to everyone who entered, they were fun to read! 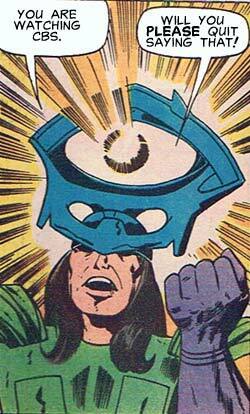 And I think Marvel or DC ought to seriously think about putting out an EYE-SCREAM action figure. That would rock.